Posted in: Arrests, Community, Crime Prevention, Media Release. At 2am Wednesday morning, officers responded to the Greystone Drive area of the Fieldstone Farms Subdivision. Witnesses there called police after seeing three suspects going through a vehicle, parked in the victim’s own driveway. Suspects ran from arriving officers, who pursed them on foot, quickly capturing two of them in nearby woods. Additional officers flooded the area and located the third suspect a short time later. All three suspects are juveniles who live in the subdivision. Each is now facing the felony charge of Auto Burglary. All three suspects were also charged with Resisting Stop/Hault/Frisk, and violating curfew. One of the suspects was also charged with drug possession. 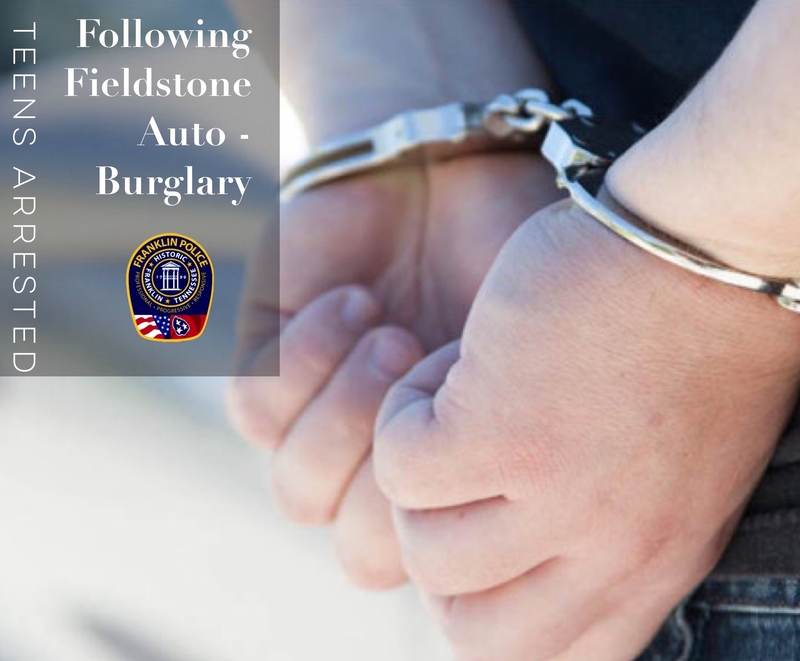 Over the past several months, auto burglars have victimized dozens of Fieldstone Farms residents. Neighbors and police hope that these arrests send a message, especially to teens. Juvenile offenders have adopted the name “car hopping” or “car surfing” to describe going from parked car to parked car in a neighborhood, checking for unlocked doors and then stealing whatever they find inside. Items taken are as trivial as spare change, but have included things like electronics, prescription medicine, and handguns. Parents are urged to have serious conversations with their teens about the fact that what they so casually call ‘car hopping,’ the law and victims call – burglary. Committing the felony offense of burglary comes with serious consequence to victims, juvenile suspects, and their families, and result in an unfortunate loss of the safety and security felt by their very own neighbors.